When you play a slot machine there are some really important decisions to make. None are more important than the amount you want to place on the next spin of the reels. That’s where coins play a vital role. Of course when you are playing slot machines online there’s no actual coins being pumped into the game. It’s a term that comes from the days when we were all in amusement arcades or down the pub playing fruit machines and putting one coin in after another to play the game. Not all slot machines use the term and perhaps in time it’ll be phased out like so many other things in life. Each slot game that you play will have coins that come in a number of different denominations. This can start from just £0.01 (penny slots) and rise up to several pounds. 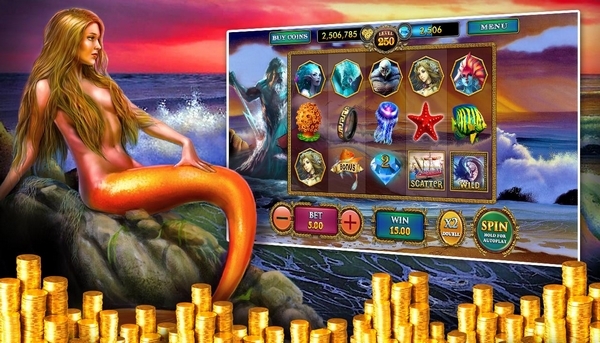 For example, in the game ‘Mermaids Millions’ you have the choice of how many coins to play and how many lines. If you decide to play at a stake of £0.01, the total stake you make on the next spin of the reels depends on the number of paylines you are going to activate and the number of coins on each of those paylines. So if you only play one payline and one coin on that payline, your stake will simply be £0.01. You can change the stake by using the control buttons that are usually down at the bottom of the screen. If you decide to change the stake to the maximum in that game which is £1 and then activate all 15 paylines and place five coins on each of those paylines then your stake will be £75. On this game rather than having to change the stake, coins and paylines you can simply press the ‘Bet Max’ button. It’s a big decision to make and one that has to be dependent on your financial budget. It’s best for you to choose a budget that means you are placing bets that you can afford to lose. Another good tip is to decide to bet low at first and then when the winning combinations start rolling in, you gradually increase your stake. Some games will have higher stake levels and as you play more coins the amount you’re staking can grow really large. This is fine if you’re a big gambler of course. When a slot machine has a huge number of paylines, then the decision becomes even more important. You may want to play as many paylines as possible on your next spin of the reels. After all you’re not going to be winning on a payline that isn’t activated. If there are perhaps 50 paylines to be activated, you have to be careful to balance the number of paylines with the number of coins you decide to go for. Sometimes though the game developers try to make the decision for you. In some games there is a progressive jackpot and you’re bound to be keen to get your hands on that. However, to be in with a chance of winning it you need to be playing at the maximum bet. That means piling the coins on and activating all the paylines. That might be something you can do for a while but not forever. This is the case in the slot game ‘Major Millions’ from Microgaming. So you can see therefore, coins will play an important part in how you play a slot game. It’ll decide your stake and if you are in with a chance of winning a progressive jackpot. As each spin of the reel takes place and you either start winning or losing, then this decision becomes even more important.